Hey creators, curators, coordinators, bakers, builders, eventers, givers, traders, partiers, planners, skaters, shakers, tinkers, tailors and mailers, this is the year of you, the year of the Maker. Makers are the people who make products and make sh*t happen. The world has a new record of small business owners and entrepreneurs who have taken big risks to make new ideas come to life. DIY-ers are a prominent, growing market segment and have sparked the rapid expansion of such sites like Pinterest. In addition, other websites like Etsy and Kickstarter have evolved to provide online platforms for people to crowd fund new products or create their own marketplace for selling their handmade goods. This mass production of customized and handmade products as well as the advancement in e-commerce means businesses like StickerYou can exist. You provide a product or service to your customers, and we provide custom stickers, labels and other sticky products to help brand your business, products or homemade goods. It's a pretty sweet relationship. That is why we are dubbing this year, the Year of You. The StickerYou crew would like to show our appreciation for all the Makers out there and help them start 2015 off right, with high-quality, cost effective products to help you Make It Stick! 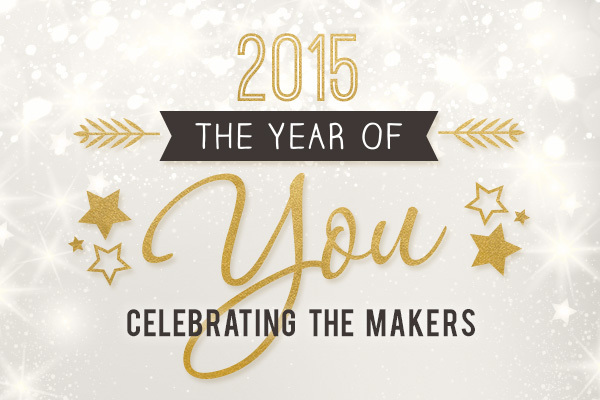 A new year means a new opportunity for your business and new projects to start for DIYers. Use promo code YOY2015 during checkout to save 20% off your first order for 2015, valid until January 16, 2015 on orders up to $100. Cheers, and Happy New Year from the StickerYou Crew. "Makers gonna make, make, make, make, make"